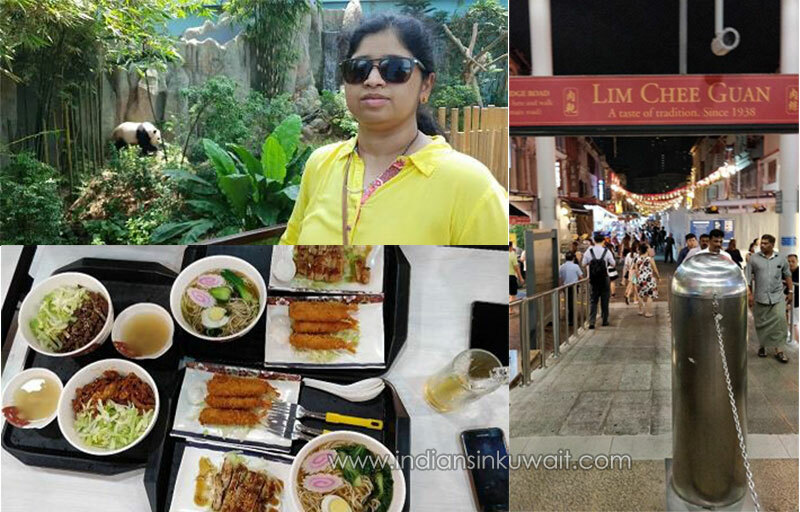 The Orient has always fascinated me so when my in-laws (my mother-in-law, sis-in-law & her husband) suggested a family trip to Singapore, we right away put on our ‘planning caps’. After a month of meticulous planning & calculations, a six-day sojourn was set. 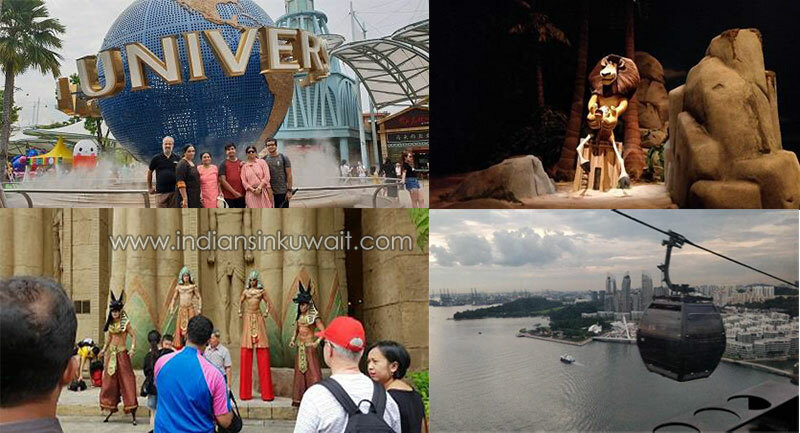 Six days might be a bit long for a Singapore visit (SG being the second smallest country in Asia), but we had senior citizens in our group (who actually proved to be the more enthusiastic lot) hence organized a leisurely itinerary. After a four and half tumultuous flight from Kochi, Kerala, we had a smooth landing at Changi International Airport along with the morning sun at 5:40 am. The immigration process was an absolute breeze and in around 45 minutes we were chauffeured to Hotel Boss, our home for the next 6 days. The size of most ‘reasonably rated’ hotels in this garden city would be a shock to many. Our room on floor 15 was approx. 12sqm but the view of the Singapore skyline from there was priceless! Singapore’s MRT (metro) can get you anywhere. After freshening up, some of us decided to stroll around. Our nearest MRT was a 5-minute walk away. Hopping onto one, we disembarked at Maxwell Food Centre to treat ourselves to some cheap Singaporean food. It’s a must visit hawker centre especially for foodies. We tried the famous Tian Tian Chicken Rice and coconut pudding for a mere S$3. The first visit on our itinerary was to Singapore Zoo where we had booked for a Night Safari. This vast nocturnal zoo is divided into different geographical zones which can be explored on foot or by the tram. We choose the 30mt. tram ride which takes you through the zoo and spotted tigers, giraffes, lions, hyenas, monkeys, deer, elephants and many more. On the way back, at the entrance we were in for a treat – a magnificent fire show. After dinner at the Saravana Bhavan near our hotel, we retired for the day. After an opulent, complimentary breakfast, we boarded a luxury bus with other tourists and were taken on a city tour. Our friendly guide explained how the country got its name. Some early explorers on their visit to this country came across a strange looking animal with its head covered with thick mane. The locals called it ‘singham’ meaning lion and the city was thus christened Singapura or ‘The Lion City’. We were taken through the famous Civic District via the Parliament House and the National Gallery. We also got to see the famous Fountain of Wealth where a scene in the movie ‘Krrish 3’ was shot. 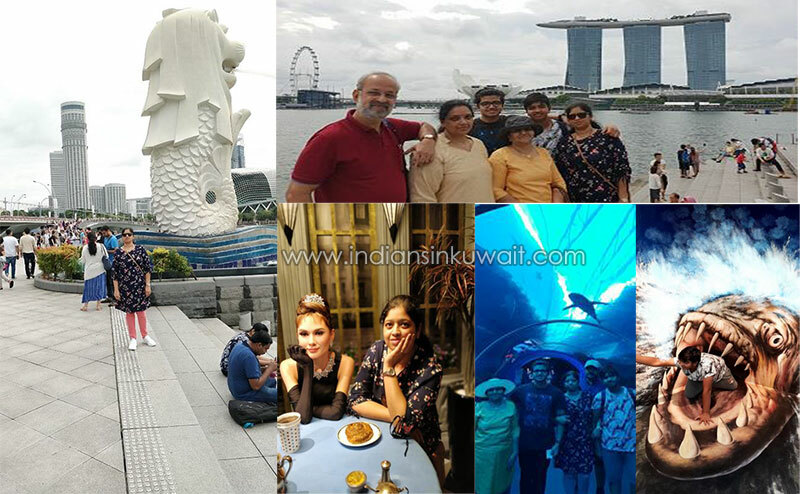 We were given 2 hours at the Merlion Park where we clicked numerous pictures with mama Merlion and baby Merlion standing on the banks of Singapore River. Papa Merlion stays separated on Sentosa island. The Merlion, the official mascot of Singapore is a creature with a lion’s head and the body of a fish. The next stop was at the Buddha Tooth and Relic Temple and Museum in Chinatown. The temple’s beautifully designed interiors, numerous statues and other exhibits speak of stories of several hundred years ago. Our last stop on the city tour was at a souvenir shop in Chinatown where we bought several gifts and mementos for friends and family. In the afternoon we were taken to Sentosa island by road. Our first stop was at Madam Tussauds. As it was our first wax museum visit, we were dazzled by all the glitz and glamour of famous personalities. We walked down the IIFA Awards green carpet and clicked pictures alongside Amitabh Bachchan, Aishwarya Rai, Kajol, RK & SRK. The kids practiced their football skills with Ronaldo and posed with Louis Hamilton. We then straight away delved into the marine world at S.E.A. Aquarium which is home to more than 100,000 sea creatures. Next up on our itinerary was the Butterfly park and Insect Kingdom. Although we didn’t get to see many butterflies we got to see several eerie looking insects. If you are not fond of these crawling creatures, you can give this place a miss. The last stop of the day where the kids had a gala time experimenting was the Trick Eye 3D Museum where we can be part of many optical illusions. The museum has an Augmented Reality mobile app (can be downloaded for free) to click all kinds of crazy pics with 3D effect. It was a fun filled day at the Universal studios in Sentosa which began with a spectacular ride in a cable car from Mt. Faber to the island. The cable line passes through HarbourFront skyscraper and across the vast, panoramic expanse of the sea to Sentosa. Once at the Universal Studios, you have to plan your rides in accordance with the various shows that are staged there (the Studio Guide flyer will be of help). At the entrance is the Hollywood themed zone and you get to walk along the Hollywood Walk of Fame. Unfortunately, we missed the Marlyn Monroe Meet & Greet Show. Next at the Madagascar Zone some of us went for the Crate Adventure ride where you come across Alex, Martin & Gloria. In the meanwhile, the boys scooted to enjoy the thrills of the world’s tallest pair of dueling roller coaster though for that they had to wait an hour in queue. We passed by Ancient Egypt where we caught two Pharaohs walking on stilts. While strolling in the New York zone we watched an exciting live performance reminding us of the early Hollywood movies. The exhilarating River Rapids Ride at the Jurassic Park truly kept us spellbound and soaked; we felt that we had landed amidst the dinosaurs of the Lost World. Although it was a tiresome day (the Universal Studios is almost the size of 25 football grounds), we enjoyed it thoroughly especially the ride back in the cable car. A day in the company of our feathered friends and an evening mesmerized by numerous colourful flowers! Our morning itinerary took us to Jurong Bird Park which is home to over 5000 multihued birds. We were in time for an interactive show with some of our prettiest and mightiest birds like eagles, falcons and hawks. The flamingos along the pond were a sight to behold. You also get to be clicked with some winged wonders but for a price. Our evening stop was at Gardens by the Bay. Located next to the Marina Bay Sands Hotel, it is a fantasy garden consisting of Supertrees, glass domes and elevated walkways. Inside the Flower Dome is an amazing display of flowers, orchids and exotic plants from all continents. It is in fact the largest glasshouse in the world. Next to this is the Cloud Dome where you get to see a man-made mountain covered with lush vegetation and a huge waterfall. We were also in time to witness the mesmerizing light and music show. There is also a 22meters high skyway connecting a few supertrees but we gave it a skip as we had one more stop before calling it a day. Marina Bay Sands…Singapore’s architectural marvel, the 7-star luxury hotel with its rooftop infinity pool. Visitors (who aren’t hotel guests) can view the city’s skyline from its 57th floor viewing platform. We got to see the vast city decked in golden lights and also spotted our Hotel Boss from there. Once again headed to Singapore Zoo, but this time for the River Safari, a river themed zoo and aquarium. First, we wandered through the aquarium on foot and then went on a magical river cruise where we got to relax after all that walking. Next, we got onto a boat for an Amazonian voyage and spotted among the lush vegetation a few tapirs, jaguars flamingoes and anteaters. Another key feature of this place is the Giant Panda Forest where we met the lovable couple Kai Kai and Jia Jia lazing around and if you are lucky enough you can also spot the red panda hanging on one of the eucalyptus branches. Our lunch that day was from Lau Pa Sat, a popular food centre located in the heart of Singapore city. It is an octagonal structure with a Victorian roof and several hawker food stalls. We ordered some not-so-yummy mutton biriyani from Indian Curry House and delicious noodles, momos and fish soup from Budding Chef, some of the popular food stalls. In the evening we set out for the famous Chinatown. With souvenir shops, boutiques to hawker food stalls and wine bars, Chinatown has it all; the place gives us a sneak peek into Singapore’s Chinese history and culture. After leisurely stroll through Chinatown and dinner at one of its numerous food stalls, we headed back. It is one of the best places for shopping odds and ends like ceramicware, hand fans, keychains and merlion shaped chocolates. However, bargaining isn’t allowed here or so they say. Before we set out to Haji Lane which is a ten-minute walk from our hotel, we packed our bags as our return flight was in the evening (all good things must come to an end). Haji Lane is a narrow, vibrant street (surprisingly Singapore’s trendy neighbourhood) with boutiques, fusion and funky restaurants which are rather on the expensive side. It’s like a little hidden treasure in the middle of the city. You will be taken aback by the beautiful graffiti, art work and multi coloured doors and windows along the street. The perfect place to click some amazingly beautiful pictures. The last afternoon in Singapore we decided to have lunch from the legendary Kerala (now they are Singaporeans) restaurant. We were recommended to try their mouthwatering biriyani, Mee Goreng (noodles) and Murtabak….. appetizing indeed! Not only is Singapore a clean, organized and well-maintained city, the people are annoyingly (for us Indians??) punctual too. Our cab arrived pronto at 3pm to take us back to Changi Airport. Here at the airport you aren’t greeted by long queues or unruly officers. You simply check-in, baggage-drop and scan your passports personally to exit! Their duty- free space is huge and true to its name (the garden city) you see greenery everywhere. As we scrambled into our respective seats on board Silk Air, I re-winded to the past one week. SG has been a unique, unforgettable experience. From up in the sky, you realize how small the island is and yet she has so much to offer her visitors. Till we meet again!